We rejoiced when we learned that Nokia is coming back to consumer devices. It's the Rolling Stones of smartphone makers - it had a wild youth but as time went on it became recognized as the best. It took a short hiatus, but now it's back. We've seen some outlandish looking hardware from Nokia, it was part of its charm - the Finns were never afraid to try something new and we got a lot of great hardware thanks to that. The Nokia N1 is not that, it's playing it safe and quite derivative in design. 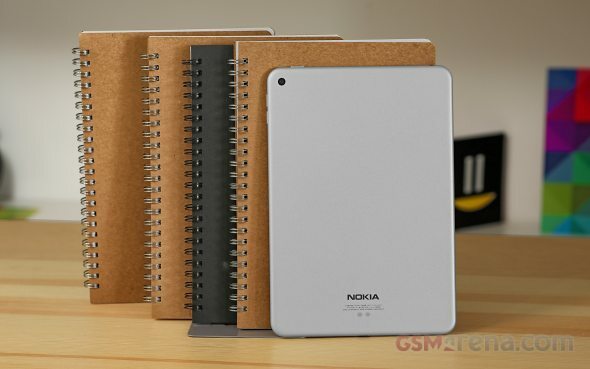 Not to be too harsh on Nokia, but the similarity to the iPad mini is distracting. It feels like a knock-off, even though the hardware is actually really nice on its own. The aluminum unibody is one seamless piece, no joints or gaps between panels, only buttons and ports and grills that have been carved out. Not that Apple has a patent on aluminum tablets, but the N1 borrows a little too heavily four our tastes and we cringe at the inevitable situation of getting asked which iPad mini is that. For smaller sizes a 4:3 screen makes for a better reading experience. The resolution is fine - 324ppi is sufficient for a tablet screen and the viewing angles are great. Unfortunately, colors appear dull and the Gorilla Glass 3 is quite reflective. The chipset is fast enough, though not the fastest if you're into gaming. The software though needs a lot of further work. We found the version for China barely usable - without Google Play Services or a suitable alternative we couldn't even create a calendar appointment as the app wants a server to sync with. Even if you could provide the Google Play integration, you'll find yourself rummaging the app store for better media apps than the pre-installed ones. The Gingerbread and Ice Cream Sandwich interfaces of some of the preloaded apps are off-putting. The international version of the Nokia N1 will hopefully come with a better app set and a rich app store to get some third-party alternatives. The camera app is pretty bad too, but the image processing is worse. The main camera just doesn't live up to the 8MP competition or what we're used to from Nokia-branded products. The selfie camera was actually pretty decent. The 4:3 format for 8-inch tablets is surprisingly popular. The Apple iPad minis are the best known examples, but Android has a lot of entries in this category as well. The iPad mini 3 is pricier, especially if you want to get away from the suffocating 16GB storage option (and you do, believe us). The software is infinitely more polished though and you do get storage options, even if they are expensive. An iPad mini 2 could reduce the price if you don't need the Touch ID fingerprint sensor. The Nvidia Shield Tablet packs the beastly Kepler GPU, which is currently the benchmark for mobile gaming. You also get a microSD card slot to store all the games and optional LTE to play on the go. It has stereo speakers pointed at the front and stylus support for a creative outlet. The Shield Tablet has a metal frame and a plastic back. HTC made the first Nexus tablet for Google and based it on the same Tegra K1 chipset as the Shield Tablet. The screen is bigger - 8.9" - as is the tablet, something to keep in mind itself in case you prioritize compactness. It has a metal frame and plastic back. You'll be the first to get the latest Android version, though the storage situation isn't great. It's getting close to two years old now, but a budget, mostly metal alternative then the LG G Pad 8.3 is a good pick. It had a Google Play Edition so it gets current software too. Probably not for long, but at least it got as far as 5.1 Lollipop. The Xiaomi Mi Pad 7.9 predates Nvidia's tablet and uses the earlier iteration of the Tegra K1 chipset, but still has amazing gaming performance. It has a plastic body, but if you can import it, you'll end up paying less than for a Nokia N1. The Sony Xperia Z3 Tablet Compact is waterproof, with a thin body that sports an aluminum frame. You can take it in the pool and it's very light too. The Triluminos screen has great colors and the stereo speakers are positioned around it, pointed forward. It has some stunning hardware but it's priced to match it. The Samsung Galaxy Tab S 8.4 has an amazing Super AMOLED with vivid colors and great contrast, slightly sharper too. The metal frame looks good, though the perforated leather on the back isn't the best. Still, you get a fingerprint sensor (not as good as the iPad's) and optional LTE connectivity. Another tablet with an OLED screen (also 8.4", same resolution) is the Dell Venue 8 7000. This one isn't as common in stores, but has a metal unibody that's only 6.1mm thick and a rare Intel-powered 3D camera. It's based on the same Atom chipset as the Nokia, but you get a more traditional Android experience.